"One of the least orderly and most poorly executed of NASA projects," was the description given to the Surveyor program whose goal was to land on the moon and send back images, both still and motion (in preparation for a manned landing). That, from a congressional sub-committee. Yes, the very same Congress that famously cannot balance its own budget or create successful programs of its own. It is a classic case of "The pot calling the kettle black." NASA was and always has been at the bleeding edge of new technology and as such lives in uncharted territory. Unexpected pitfalls lurk everywhere - a minefield of "gotchas." Not that every organization can't benefit from external oversight to prevent "blinders-on" engineering and management teams from straying too far off the defined (though not yet beaten) path, but having the notoriously pompous and buffoonish bureaucrats of Congress admonish largely creative, brilliant minds of NASA staff (and their subcontractor teams) regarding landing an automated craft on the moon for the first time ever is infuriating - then and now. "Creativity cannot be scheduled," as the saying goes. Can you tell I mostly despise politicians and bureaucrats? My idiom- and vernacular-filled rant has hereby concluded. First engineering test model is undergoing pre-shipment tests at the Hughes plant. It will carry a 20-pound payload consisting of one tv camera. Later craft will carry scientific experiments. 'One of the least orderly and most poorly executed of NASA projects,' is how a congressional subcommittee describes the program to soft-land a series of 17 tv- and instrument-equipped spacecraft on the moon. A congressional subcommittee has accused NASA's Surveyor program, a 17-mission moon study, of mis-management, delays, high costs, and of using equipment that might cause a spacecraft to crash. The changes come less than three months before the National Aeronautics and Space Administration attempts the first Surveyor shot - to land on the moon a television camera that can examine objects as small as a grain of sand. The Subcommittee on NASA Oversight of the House Committee on Science and Astronautics criticizes the Surveyor program in a 35-page report based on its two-day inspection in September of the Jet Propulsion Laboratory (JPL) in Pasadena-NASA's manager of the program - and the Hughes Aircraft Co. in Culver City-prime contractor for JPL. • The spacecraft has a good chance of crashing onto the moon without sending back a single picture. As of September, "certain technical problems" in the radar altimeter and Doppler velocity sensor system - absolutely necessary for landing successfully-still "discourage high confidence in the system." • Heat losses from the spacecraft during the long lunar night are now expected to be so high that the first four spacecraft won't survive more than a few hours; certain equipment may freeze in minutes. • The scientific payload on the first four spacecraft, engineering test models, will consist of only 20 pounds-a single-scanning tv camera. The next three flights will carry six experiments weighing 114 pounds; the payload was planned to weigh 345 pounds. The 10 remaining flights - there will be 17 Surveyor flights in all - have not yet been planned. • The first launch, now scheduled for February, 1966, had been originally set for August, 1963. "And since the first operational spacecraft [with scientific instruments] will not be flown until 1967, the delay might be viewed as approaching four years." • Costs have risen unexpectedly. In January, 1961, NASA said the Surveyor program - which then consisted of seven spacecraft - would cost "upward of $50 million." The subcommittee found that by June, 1966, the program will have cost $350 million, exclusive of launch vehicles. The subcommittee did not stop with only "major" items. Members were unhappy over the government's having to absorb a $2-million loss - plus a delay in the program - when drop tests of two landing packages failed last year. The packages contained the vernier engines, the main retro-rocket and the radar altimeter and Doppler velocity sensor. Hughes dropped the packages from balloons, 1,500 feet above the desert. An electrostatic discharge caused a failure in the release mechanism during the first test, and the vehicle dropped prematurely and crashed. "The system apparently was not satisfactorily grounded," the report said. In the second drop, five independent components failed and the package became entangled in the balloon's tether. Hughes has built two new test vehicles and will build four more. Homer Newell, associate administrator of NASA for space science and applications, bluntly told the subcommittee: "I think the Hughes contractor agrees that these tests weren't prepared for or conducted properly." Why it happened. The subcommittee ticked off a number of reasons for the discouraging state in which it found Surveyor. Surveyor was one of NASA's first approved space programs and was undertaken before the agency fully understood "the demanding nature of space research and development projects," the report said. As for Hughes, the firm's vice president and general manager, L. A. Hyland, told the subcommittee: "I think it is fair to say that we pretty much underestimated the magnitude of the job ... It is a much bigger job than we originally anticipated." Insufficient planning. Much of the trouble, everyone agreed, has resulted from the lack of work done before the decisions were made to go ahead with the project and to award a contract. Because of this, 46 modifications and 80 change orders in the program have been made since Hughes' contract was awarded March 1, 1961. The result, the subcommittee said, is "one of the least orderly and most poorly executed of NASA projects." Also, during the first three years of work on Surveyor at the Hughes plant, the staff at JPL was deeply engaged in two major in-house projects - Ranger and Mariner - both of which would precede Surveyor. Compounding this obstacle to adequate control of Surveyor, the subcommittee said NASA had not permitted JPL to hire enough personnel. JPL began work on Surveyor with a staff of 20. In three years, this climbed to 100. Now, there are 500 people working on Surveyor at JPL and 2,400 at Hughes. The subcommittee blames everyone involved for waking up three years too late to find that Surveyor was in serious trouble: NASA for not monitoring JPL and Hughes better, JPL for "virtually turning Surveyor over to Hughes," and Hughes' top management for not giving the program appropriate attention and for being slow to respond to NASA's recommendations to reorganize. Spokesmen for both JPL and Hughes say they can't argue with a congressional report; and JPL adds that their people "who have read the report consider it technically accurate." The consensus at JPL is that no one at JPL, Hughes or NASA has a legitimate complaint. The Surveyor program will continue, since its findings are essential for designing much of the Apollo equipment that will land men on the moon before 1970, and after the subcommittee's report, probably faster and more efficient than before. Surveyor begins its trip to the moon folded up inside the nose shroud of the newly-developed Atlas-Centaur launch vehicle at Cape Kennedy. Shortly after launch, when the shroud is ejected, the spacecraft extends its legs and antennas; when Centaur later burns out, Surveyor continues its journey alone. Some 15 hours after launch, the ground tracking station in California gives the craft a mid-course guidance correction plus instructions to turn around. Its landing legs then will be in the correct position, and its solar cells will face the sun. After it locks on the sun, the craft is commanded to roll around its axis and seek the star Canopus. Stabilized by the sun and Canopus, the bus then coasts to the moon. Attitude corrections are made by cold gas jets mounted on the ends of the landing legs. As the bus approaches the moon, a retro-rocket is fired to slow it from 9,000 feet per second to 350 fps as it descends to about 25,000 feet. In addition to the main retro-rocket, three controllable-thrust vernier engines - one of which swivels for roll control - there are an altitude-marking radar; yaw, roll and pitch gyros of a three-axis auto-pilot; an analog computer; three beams of Doppler velocity radar; and a radar altimeter. This system must perform several critical functions simultaneously, compatibly, and with precision. At an altitude of 13 feet, the vernier system is shut off and the spacecraft free-falls to the surface. Altitude-marking radar. When the spacecraft is about 120 miles above the moon's surface, a ground station commands the spacecraft's altitude-marking radar (AMR) to begin operating an on-board computer to assume control of the craft during the descent and landing operation. The final moments of flight are too brief to permit commands to be issued from the earth - 1 1/4 seconds away. 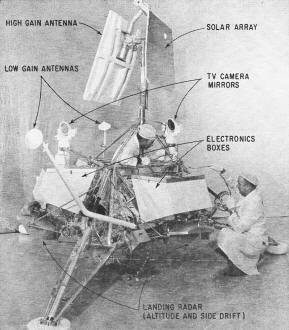 The surveyor spacecraft, about 15 hours after blast-off, gets a course correction from the California ground station, which also commands Surveyor to turn its legs toward the moon for landing, and instructs it to lock on the sun and the star Canopus for guidance. Sixty-six hours after launch, an elaborate system consisting of a retro-rocket, vernier engines and radars - still not working well, according to the subcommittee's report - is supposed to ease the bus down on the moon. Mounted inside its own dish antenna below the nozzle of the main retro-engine, the AMR keeps track of the altitude down to a distance of 50 miles from the touchdown site - whether this distance be straight down or at a slant. At 50 miles the AMR destroys itself by signaling the retro-engine directly above it to fire. The AMR is blown away, and the radar altimeter and Doppler velocity system (RADVS) takes over. The RADVS, criticized by the subcommittee for "severe technical difficulties," is an adaptation of the Doppler navigational radar built by Ryan Aeronautical Co. for helicopters. To modify it for the space-craft, its power was increased to about 550 watts, its sensitivity was increased and it was made less vulnerable to spurious noise. These changes were made by upgrading components and circuits and packaging for a space environment. The technical problem, however, is still noise. The acoustic noise of the vernier engines, JPL says, gives false indications to the radar. The noise may be transmitted to the radar dish via air - which would not exist near the moon, and hence would not be a problem - or it could be transmitted via the framework of the spacebus and would be just as disastrous on the moon as it is on earth. "Although the problem has not been solved yet," JPL says, "it now appears that the solution is just a matter of a little more time." The first Surveyor spacecraft is already assembled and is undergoing preshipment tests at the Hughes plant. Hardware for the other three engineering test models is in various stages of readiness. Work is under way for the three operational craft that will each carry six scientific experiments: the television experiment, touchdown dynamics, surface sampler, micrometeorite detector, alpha backscattering experiment and a single-axis seismometer. Television. Besides the one scanning tv camera carried on the first four engineering test models, the three operational models will have an additional survey tv camera. Both cameras will be fixed to the spacecraft frame but will be trained on movable mirrors that will sweep the horizon in a broad horizontal arc after landing. The mirrors can also be tilted vertically to scan from the landing pads of the spacecraft, or bus, to the moon's horizon. The two survey cameras have zoom lenses but will be used in two focal-length positions only: 25 mm and 100 mm. Focusing will be linear from closeup to infinity and controlled from the earth. Exposure adjustment will be automatic. First pictures. Before launch, the survey cameras will be focused on targets mounted on the spacecraft. The cameras will look at these targets immediately after landing to let earth control know if anything was jolted out of adjustment and should be corrected. The first set of terrain pictures will be focused by trial and error. The correct settings will be recorded and used for subsequent pictures. As lighting conditions around the Surveyor landing site change, subsequent pictures will emphasize different lunar features. The two cameras can be preset to produce stereoscopic pictures. Color pictures. Although the lunar pictures will be in black and white, green and red filters will be rotated in front of the cameras' lenses in sequence. Scientists hope that filtering different colors will bring out details otherwise lost. 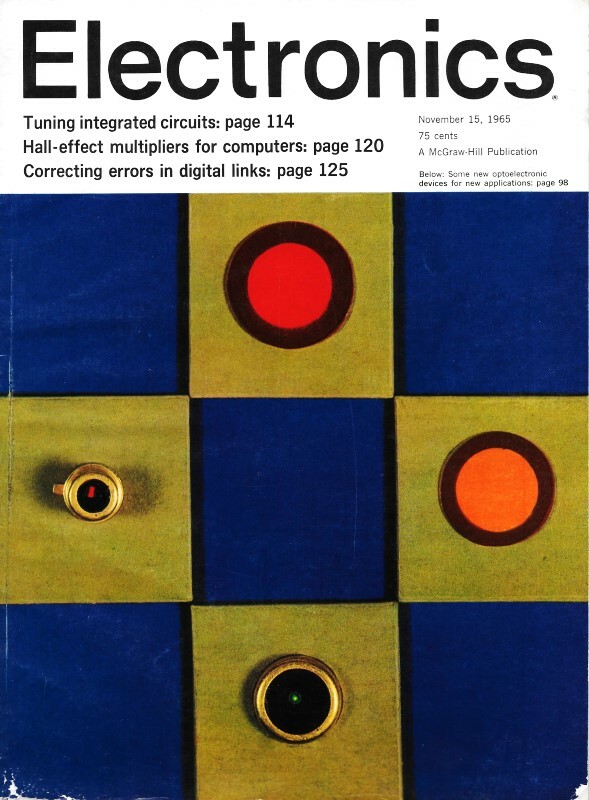 It may also be possible to reconstruct color pictures from the filtered black and white pairs using the Edwin H. Land process [Electronics, July 26, p. 26]. Resolution of the cameras will be 600 lines per frame. Although this is inferior to Ranger's 1152-line resolution in the full-scan cameras, Dennis H. Le Croissette says that this will be good enough to define a nearby grain of sand one-half millimeter in diameter. Le Croissette is manager of instrument development for the Surveyor project at the Jet Propulsion Laboratory in Pasadena. A third camera. To televise the approaching lunar surface, a third camera may be carried but there is still disagreement over this. Those who oppose this camera argue that so much complex data must be exchanged to land the spacecraft successfully that there would be no room for tv transmission. Also, the pictures would only duplicate those the last three Rangers took and the resolution would not be as good. The critics also say that while Ranger televised the moon's surface down to an altitude of a few hundred feet, Surveyor's camera would not be able to see the surface after the retro-rocket fires at an altitude of 50 to 60 miles; it would see only the rocket's plume. Those in favor of the downward-looking camera say it is needed to show where the bus is landing. All the tv cameras would operate the same way: the complete picture on the vidicon would be scanned in about 1.1 seconds and transmitted in real time. Allowing for vidicon erasure and camera switching, a picture could be transmitted every 3.6 seconds, or 1,000 per hour. During the 2.5 seconds between picture transmission, the communications carrier would transmit other data. Engineering and touchdown. Instruments for testing engineering performance of the spacecraft will measure conditions such as temperatures, voltages, pressures in tanks, the inertial guidance system, star locks, earth altitude through Doppler shift techniques, moon altitude and side drift from the bus-mounted radar. The Surveyor will have landing characteristics similar to the Apollo program's Lunar Excursion Module (LEM). To obtain a preliminary estimate of what the LEM will encounter, engineering instrumentation will provide data on velocities, accelerations, impact and other landing dynamics. Instruments will also measure the condition and attitude of various controllable components or systems: landing legs, antennas, solar panel array and transmitters. In all, engineering data will be received from 200 to 300 sources. Because of their importance or frequency of change, some instruments will sample more often than others. This will be done mainly through commutation channels before launch, with some sampling possible in flight through earth command selection of commutator banks. Surface sampler. A scoop-claw with an accordion-like arm will be able to dig a trench under the eyes of the tv cameras to reveal the compaction, uniformity texture, structure, angle of repose and other physical properties of the material down to about two feet. Strain gauges will provide quantitative data on the bearing and shear strength of the material. The claw also has potentiometers to measure arm position, an accelerometer to measure vertical deceleration as the scoop strikes the surface. and force transducers to measure the vertical force up to three pounds and the retraction force up to 200 pounds. Micrometeorite detector. Measuring the flux momentum, energy, and mass of particles that could scratch optical surfaces or possibly puncture a space suit is the job of a micrometeorite detector. It consists of a steel plate with detectors bonded on each side and aligned vertically on the spacecraft. A hit is recorded when a meteorite pierces the capacitor, which results in a temporary short. The size and velocity of the meteorites can be estimated from the pulse height and width of the short, and the sound output through an acoustic transducer bonded to the plate. Alpha backscattering. To analyze the elemental composition of the lunar material, a curium-242 source of greater than 25 millicuries will be used to bombard a special analyzer box with alpha particles. The alpha-proton reactions to the bombardment will be measured to determine the chemical elements in the lunar surface. The alpha scatter analyzer can be moved about by a controllable arm. Either of the tv cameras can be adjusted to look at the analyzer and help guide the claw. Single-axis seismometer. To determine whether the moon is seismically active, a conventional seismometer with special modifications for the severe lunar environment will be carried. A high temperature spring was developed along with a special thermal shell to reduce temperature changes. During flight and landing, the floating magnet will be held in position by clamps to avoid damage. A double squib arrangement will release the magnet after landing. The instrument is designed to measure the number, magnitude, spatial distribution and focal depth of moonquakes. It has a frequency response over the range of 0.05 to 10 cycles per second. In the course of analyzing the seismic records, it is anticipated that other information will be obtained, such as the spectrum of seismic background noise correlated with thermal changes and meteorite impact up to 100 miles away. The data should yield some information on elastic properties and structure of the moon along with the internal constitution and damping properties. Components. Because monolithic circuits were not sufficiently developed at the time Surveyor was designed, only discrete, solid-state components in conventional, high-density, welded, cordwood-type modules are used. Surveyor's electronics are not at the top of the state of the art. To protect the fragile payload, most of the electronic gear is packaged in two boxes, well-insulated with multiple layers of aluminized Mylar that repel heat from the sun and expel heat generated inside. The tops of the boxes, facing the sun, have a sheet of polished material that reflects solar radiation and yet allows internal heat to pass through. The sides reflect heat from the moon's surface. When the lunar night begins, batteries maintain heaters inside the boxes. It is hoped that the temperature change inside the boxes will not exceed 125° F or go below 40° in one box and 0° F in the other. The outside temperature changes from +250° F to -200° F. The batteries will not be able to keep the heater going for the full lunar night and eventually the internal temperature of the boxes will drop to the ambient temperature of -200° F, which will put the electronic circuitry out of commission. Transmission. Tv transmission will be analog and will use 220 kilocycles of the three-megacycle communications bandwidth. The analog signal will modulate the carrier directly instead of a subcarrier; this will permit only one tv camera to transmit at a time and will shut off all telemetry transmission from scientific experiments. Communication design changes are being considered to permit simultaneous transmission of tv and other science information on later Surveyor shots. This may be done by using sidebands. While a few of the scientific and engineering experiments will transmit data in analog form, most of it will be transmitted digitally - if the transducer's output is analog it will be converted to digital form before being transmitted - in 10-bit words at an earth-controllable rate between 17.2 and 4,400 bits per second. Sheldon Shallow, chief scientist of the Surveyor program at Hughes' Space Systems division, says that the most common rate will be 550 bits per second. Transmitter. For redundancy, the bus will carry two transmitters and two antenna systems. To provide spherical coverage, two small, cone-like, omnidirectional antennas will be placed on opposite sides of the bus on extended booms. On the vertical mast, along with the solar cell array, there will be a high-gain planar antenna. Transmission can be switched between the high-gain and omnidirectional antennas by earth command. The high-gain antenna will be used for transmission from the lunar surface. Center frequency of the communication channel is 2.295 gigacycles. Power for the bus will come from a combination of solar cells and rechargeable silver zinc batteries. The solar-cell array will be adjusted for sun attitude by earth command approximately once every earth day.